People with tattooirokoi in the form epaulettes on the shoulders in everyday life are very rare. The fact that prick them with criminal authorities, particularly those who have been repeatedly imprisoned for serious crimes. 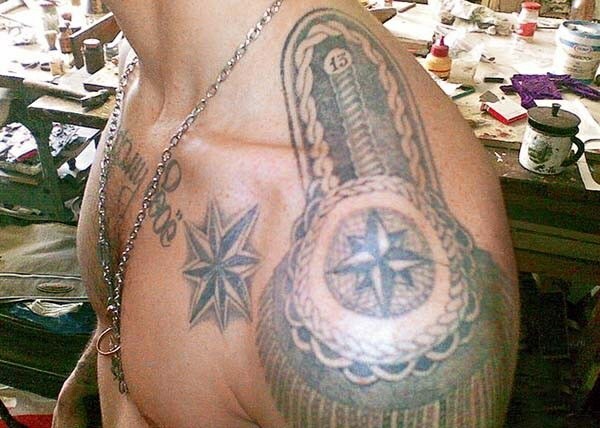 "Epaulettes" on the shoulders often can be seen from the most respected prisoners, as the most common meaning of such a tattoo – final rejection to stand in the way of correction. This tattoo can be seen in the most daring thieves and murderers who consider themselves the elite of the underworld. Not all prisoners have the right to wear such tattoos. The presence of epaulettes in this case, the symbol chosen, which immediately shows the others a special status for criminals. To see the image in the form of epaulettes, you can also have young guys that a long time spent in prison, characterized the austerity regime. For example, the young person receives the right to a tattoo, having spent at least 50 days in disciplinary isolation. To emphasize his "services", the guys often complement epaulettes explanatory inscriptions. Finally, there is another meaning of this tattoo. Her chosen people, tough and uncompromising positions itself against the prison regime and administration, and guards. The most brutal of them complement shoulder straps that says ELEPHANT, which means "death COP from a knife" or typical images. These tattoos are the most rare, as prison officials, identifying them troublemakers, in case of any problems in the behavior can use non-lethal weapons to subdue. To use this tattoo is very risky, and sometimes even silly. The value of such a tattoo depends on the characteristics of the image. The most common variant is the figure with the cross. It means that the man is proud of his crimes and considers itself the ideological thief, a murderer, etc. Usually tattoo epaulettes with a cross choose for themselves already adult prisoners, not a minor. The prisoners, wishing to emphasize the authority, strength, power, aggressiveness, choose whole composition. As a rule, they complement epaulets picture large predatory cats, snakes, and swords, skulls, bones, clawed paws, fangs, barbed wire. Each of these drawings has its own special meaning, but their meaning is to demonstrate power and authority. Among the people who were openly waging war "with the system", including the state, police and jailers, is widely spread tattoo pierced with a knife overhead with the words EXPLOSIVES, which means "internal forces".